Many people have heard of the reputable Beachcomber hot tubs. They’re known for their durability, and craftsmanship. In fact, Beachcomber has been making their hot tubs for longer than most other manufacturers, and have one of the best reputations among hot tub manufacturers for their all around commitment to quality. If you need to replace your Beachcomber spa cover, let us help you. Our easy to use ordering system allows you to build a custom cover to fit any size or shape hot tub. We provide numerous enhancements and as always, free shipping on all orders. From their site: The first Beachcomber Hot Tub was completed back in 1978. It was in the small farming community of Surrey, just 10 miles from the U.S. border, on the Pacific Coast. We have innovated regularly and grown steadily ever since. Today Beachcomber continues to expand across the United States, Europe and Asia. 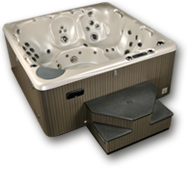 They remain a recognized brand in the hot tub manufacturing industry, and their product line continues to expand.